In whirlwind tour, the nation's HUD secretary saw federal programs in action. LEWISTON — Finding two of the nation’s most prominent politicians at the door of his Androscoggin Avenue home Friday was a surreal experience, Robert Edwards said. He’d known that U.S. Sen. Susan Collins and former Republican presidential candidate Ben Carson were coming, but it’s one thing to give them the green light to talk to him about programs that had removed lead paint and added insulation and quite another to find the pair at his front door. 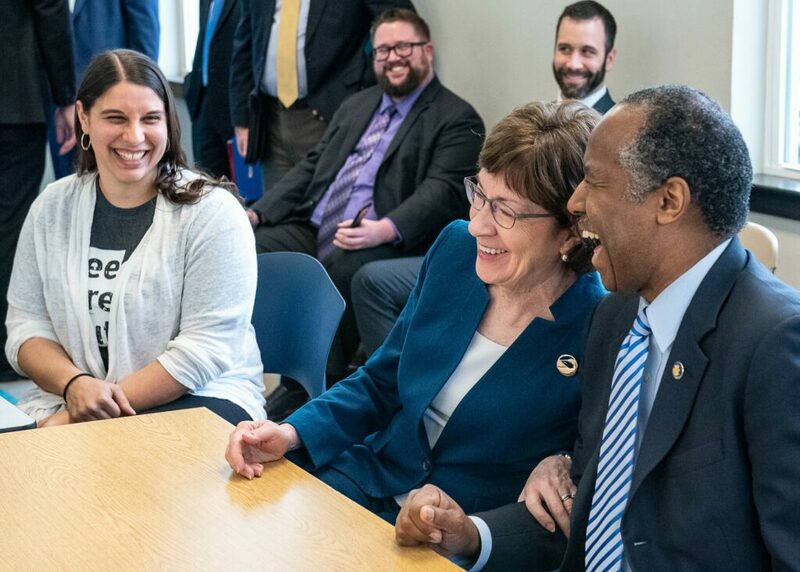 U.S. Sen. Susan Collins, right, and U.S. Secretary of Housing and Urban Development Ben Carson visited the home of Robert and Christina Edwards on Friday, where their 5-year-old daughter, Future, captured much of the attention. He and his wife, Christina, said they mostly just wanted to thank Collins and Carson, now serving as the secretary of the Department of Housing and Urban Development, for providing the funding to make the programs possible. With 5-year-old daughter Future at their side, they happily showed the pair — and a passel of aides and reporters — around the cozy, well-kept 1923 home they’d purchased a year and a half ago. “The programs made a big difference for us,” Christina Edwards said, including the removal of peeling lead paint from the back porch, which had been off-limits for Future until the work was completed. Carson said the lead paint program has been a priority for him — and as a result its funding has gone up sharply to $240 million this year. Next year, President Donald Trump proposed hiking it to $290 million nationwide. Carson, who rose to fame as a neurosurgeon, said that given the damage lead paint can do to developing minds, taking it out of the home environment is crucial. “It’s very important work because of youngsters like Future,” Carson said. 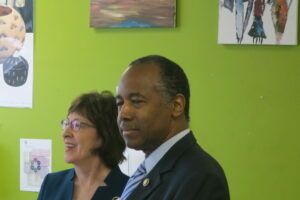 Ben Carson, the nation’s housing secretary, and U.S. Sen. Susan Collins of Maine toured the Tree Street Youth Center in Lewiston on Friday. Even though the city has been getting enough federal cash to clean up 225 housing units annually, Lewiston’s director of economic and community development, Lincoln Jeffers, said it’s not enough. He said it will take about 80 years to deal with all the lead in housing downtown at the current rate. To cope with the need, U.S. Rep. Jared Golden, a Lewiston Democrat, said Friday that HUD ought to work with Congress to increase the budget for lead hazard reduction funding to $2.5 billion annually for the next five years — about eight times the spending level sought by Trump. Asked about Golden’s proposal, Carson said new technology and new techniques may resolve the problem in coming years without socking taxpayers. 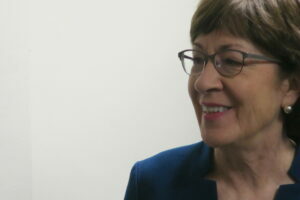 Collins said that from her perch on a key appropriations subcommittee, she will make sure that the increase sought by the president for lead abatement is approved — even though lead paint is an issue mostly critical to the Northeast, where many homes were built before the 1978 ban on lead paint. The stop at the Edwards home was one of four places Carson visited in Lewiston and Auburn on Friday, one of his nearly weekly efforts to get out of Washington and see how HUD programs are working. 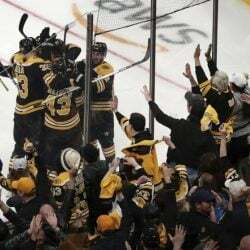 Nobody mentioned that Carson’s proposed HUD budget would wipe out the $3.4 billion Community Development Block Grants program, a tool for cities such as Auburn and Lewiston to address local issues. It’s also a key source of funding for a major expansion at Tree Street that Carson toured. U.S. Sen. Susan Collins at New Beginnings in Lewiston on Friday. An earlier effort by the president to end the CDBG program got nowhere when a GOP-controlled Congress refused to go along with it. With Democrats at the helm in the House, Trump’s proposal has even less chance of approval. “You do a lot with a little,” he told Tree Street leaders, an assertion he echoed at New Beginnings. Carson said he was impressed by Maine. “It’s wonderful, even if the weather isn’t the best,” he said, adding that he ought to return in the summer.